As many of you know, the 2008 U.S. political conventions--two weeks of party business that begins for the Democrats in Denver today, and for the Republicans in Minneapolis next week--marks the beginning of the general election season. To help you stay informed and engaged in the upcoming election, we're launching a one-stop shop for political information: www.google.com/2008election. Can't make it to Denver or Minneapolis? Go to our conventions site to view the latest news, videos, photos and blog posts. 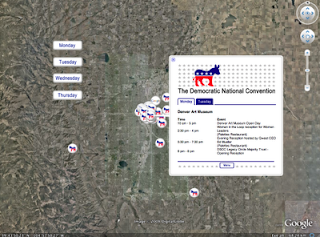 See the DNC agenda in Google Earth and fly to each event and venue. We also have 3D models of the convention venues in the Presidential Conventions collection in the Google 3D Warehouse. Turn on the "3D Buildings" layer in Google Earth, fly to Denver or St Paul and you'll feel like you're there in-person, and you saved the airfare! You can also interact with a wide variety of political mash-ups in the Google Maps Elections Gallery. The Republican National Convention is actually in St. Paul, MN. It's a common mistake to mix up the two Twin Cities.